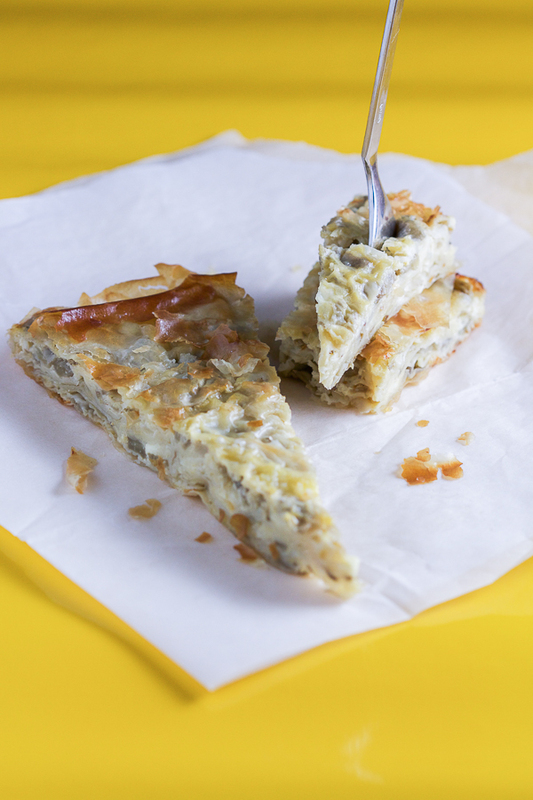 Eggplant and cheese pie: unconventional, savory, simple. Ever since I decided to eat more vegetables, eggplant had become a point of focus for me. It’s a wallflower, the eggplant. Turns out, possibly a fruit. References argue about this. Some say fruit, some say vegetable. Why it seems to be an acquired taste I don’t know. I guess it’s similar to mushrooms in that way. I can’t help but appoint myself its unsolicited ambassador. Just in the past year, along with all of you, I’ve explored many of its transformations. There is the boat eggplant filled with minced beef in a tomato sauce peppered with herbs. Stuffed, as we say. A classically Balkan way to prepare a vegetable. 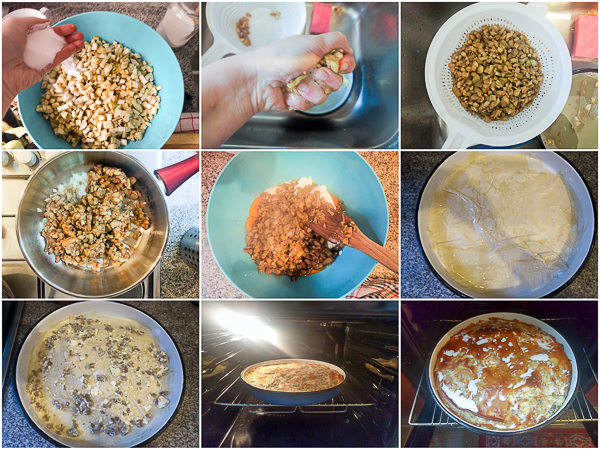 Then it showed up in two versions of casseroles: one in a vegetarian take on a moussaka where it intertwined with potato and zucchini in layers, and in another moussaka in which the eggplant played a more prominent role in taste mediating between soft potatoes and strong beef. My favorite eggplant recipe on the blog is the one with the worst photographs. They may be the reason why to this day I haven’t to this day one comment on the recipe. It isn’t unusual not to receive a comment on a blog post. But this dish is the kind to leave people at the table in a trance. Roasted red peppers, soft eggplant, veal and carrots. Layered and baked. Thickly accented with garlic. Combine with homemade bread, and you’ve graduated kitchen. Funnily, this eggplant opus did not include any pies. Now that’s unusual! 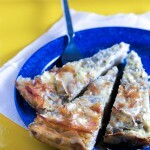 Balkan cuisine is strongly tied to its pies. They’re the foundation, the beginning and end of food. Going through the catalog of my memories, I couldn’t find one instance where I ate an eggplant pie. I asked around, and my family couldn’t either. Sister said right away it wouldn’t work, because of its consistency. By now I know eggplant is a hard one to appease. One has to work for eggplant. It doesn’t reveal itself before you put in the time. It doesn’t soften up, no pun intended, until you allow it to sweat. But I also was aware of how its softness impacts the palate. I looked around, and indeed found others ventured down the eggplant pie avenue. But between a few recipes, I had to draft my own. Knowing its nature, putting it alone in a pie would have overwhelmed the eggplant, and underwhelmed the pie. It needed a partner. Something to be the backdrop. You can guess the next part. Adding cheese resulted in a solid eggplant and cheese pie partnership. The only thing I had to make sure was to prep the eggplant, indeed by letting it sweat out its bitterness. And for extra caution, I threw it on fire before combining. A wise woman once advised you shouldn’t immediately reveal a pie’s stuffing to your guests. Instead, let them be surprised at what gems they came across. It sums up eggplant perfectly. Peel and dice eggplants and place in a larger bowl. Sprinkle very generously with salt and mix thoroughly until all the eggplant dices have been salted. Leave aside for 1 hour so eggplant sweats out the bitterness. Wash diced eggplant really well to get rid of the salt. Afterwards, squeeze by the handful to get the liquid out as much as possible, and transfer to a new bowl. Dice and simmer onion in a large skillet with a little bit of oil over medium heat. When it crystalizes, add eggplant and simmer together another 15 minutes or so. Add a little bit of water on occasion if necessary, to avoid burning. In large bowl combine ricotta, feta, sour cream, eggs, and 1/2 teaspoon salt. Mix well. Add eggplant and mix again until you get a consistent mass. 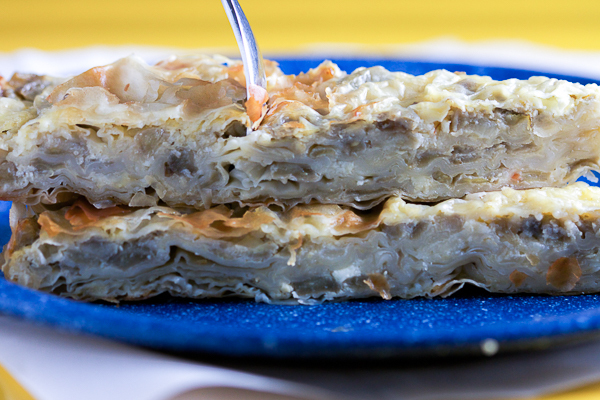 Take out your phyllo and a baking pan. Oil the pan, and place two phyllo sheets on the bottom, brushing each sheet with oil. Grab a generous amount of the filling (about 4-5 tablespoons) and spread evenly over the top sheet. Layer 2 sheets on top of the filling, and brush (spray) each sheet with oil before adding the next layer. 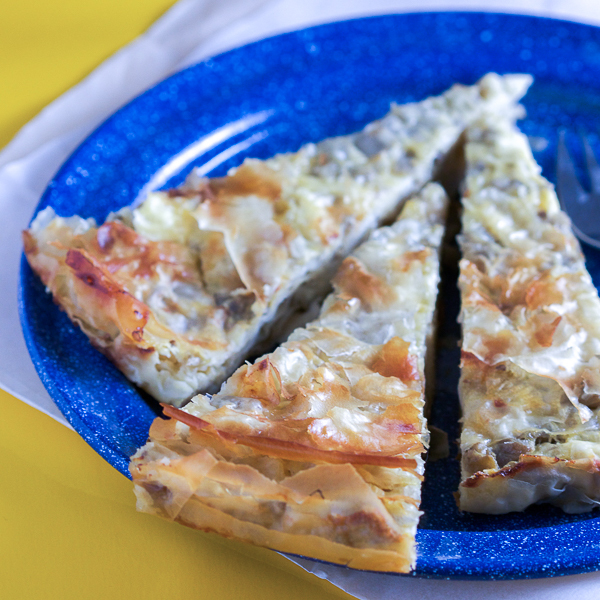 Repeat until you run out of the filling and phyllo, making sure to leave 3 sheets for the top of the pie. Bake at 390F for 20-25 minutes, making sure you turn the pan around 90 degrees about halfway through. Lower temperature to 350F and bake another 10 minutes. Take the pie out of the oven and spray with milk. Leave to cool for 30 minutes, and then eat. 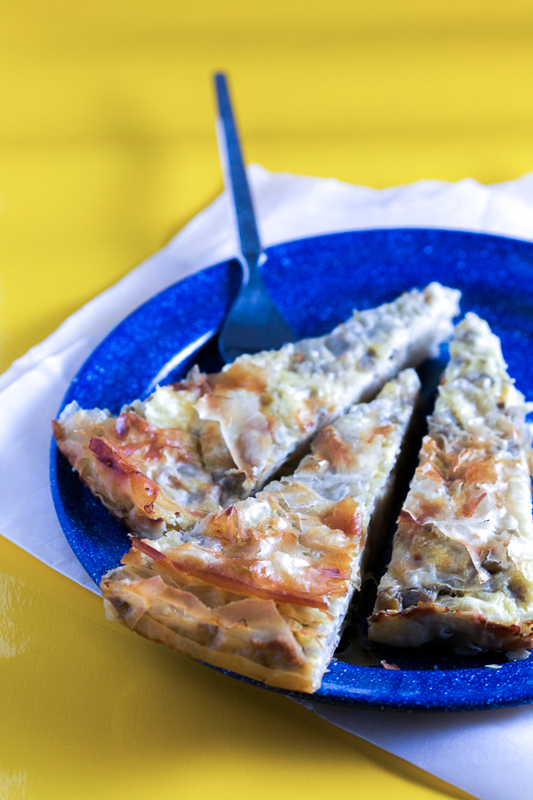 Take phyllo out of the freezer the night before you’ll use it. If it was in the fridge you can use it the same day.